Every day, 2,300 children under 5 and 145 women of childbearing age die in Nigeria, making the country the second-largest contributor to the under-5 and maternal mortality rate in the world, according to UNICEF statistics. This situation is particularly painful since most of those deaths could have been avoided with simple, low-cost interventions. Although recent trends show that the country has made progress in reducing infant and under-5 mortality rates, it will still be unable to achieve the Millennium Development Goal of reducing child mortality by two-thirds by 2015. At the same time, the deaths of newborn babies—the majority of which occur in the first week of life—represent 25 percent of the total deaths of children under 5 in the country. Although there are wide regional disparities in child health indicators, the northeast and northwest zones of the country have the worst child survival and maternal mortality figures in the country. Malaria, pneumonia, diarrhea, and measles are among the preventable or treatable infectious diseases that account for more than 70 percent of under-5 deaths in Nigeria. A woman’s chance of dying from pregnancy and childbirth in Nigeria is approximately 1 in 13, an extremely high figure and among the highest in the world. Regarding maternal mortality, it is known that women who have good prenatal care stand a much better chance of delivering safely. Despite government efforts, the coverage and quality of health care services for women and children continue to be poor in Nigeria. In addition to the government, several U.N. agencies and national and international nongovernmental organizations (NGOs) are trying to improve the situation, particularly in remote regions of the country that are far away from Nigeria’s main cities. A program called Partnership for Reviving Routine Immunization in Northern Nigeria; Maternal Newborn and Child Health Initiative (PRRINN-MNCH) is presently being carried out in the four northern states of Jigawa, Katsina, Yobe, and Zamfara, which have particularly poor child and maternal health indicators. The program aims to improve the quality and availability of all maternal, newborn, and child health services in those areas. 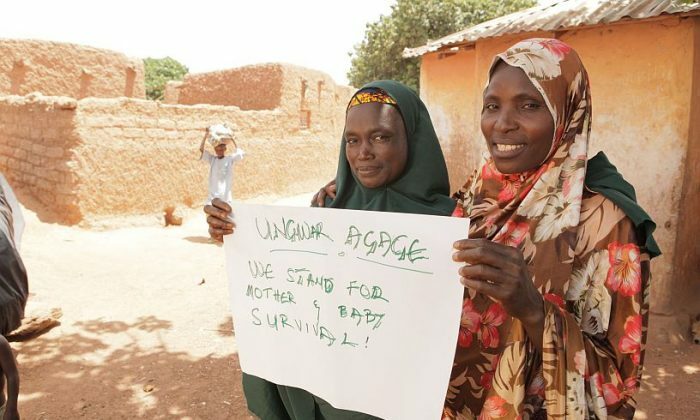 It is working, for example, with the federal, state, and local governments in close consultation with the communities to improve the quality and availability of health services, including antenatal and postnatal care, to have safer deliveries, better care for newborns and infants, better nutrition, and wider routine immunization against the most common vaccine-preventable diseases. Through such program interventions, numerous health care centers have been rehabilitated. There is now a more active and effective integrated management of primary health care services, from state level to grass-roots levels and, as a result, greater and better responsiveness to patients’ and communities’ needs. An important aspect of the program has been the regular collaboration not only with development partners and government bodies but also with traditional and religious leaders to ensure that health messages are widely distributed and assimilated in the communities. This also facilitates the implementation of planned activities and ensures communities’ participation. One important result has been the decline in the infant mortality rate (IMR) in the clusters where the program has been active. One measure of the impact of the activities on the IMR is that in all the clusters covered by the program infant deaths have declined from 70,000 to 48,000 per annum. This decline in IMR was helped by the improved routine immunization activities being carried out under this program. In countries in development, high rates of low-birth-weight babies are due to pre-term birth and to impaired uterine growth. They contribute significantly to high rates of neonatal mortality. Since effective interventions are limited, a technique consisting of pre-term infants carried skin-to-skin with the mother (“Kangaroo Mother Care”) has proved effective for thermal control, breastfeeding, and bonding with newborn infants. This technique has been increasingly used in this program and has probably also contributed to the decrease in IMR observed. By using a holistic, comprehensive approach to the health problems affecting mothers and children in the northeast and northwest areas of the country high infant and maternal mortality rates have decreased and the technical skills of the medical and paramedical personnel have improved, thereby creating the basis for a consistent, steady development in the country’s health care system. Dr. César Chelala is an international public health consultant and a co-winner of an Overseas Press Club of America award. He has carried out health-related missions in over 50 countries. worldwide.